Effective for cats and dogs 8 wks and older. Kills 100% of fleas in 24 hrs and remains waterproof for 30 days. It also slays the next generation of flea eggs and larvae. Frontline should not be administered to rabbits. 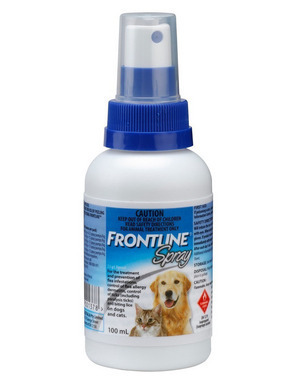 Frontline Spray may be used on puppies and kittens from 2 days of age and on breeding, pregnant or lactating females. For topical use on cats and dogs only. Do not give to pets by mouth. Avoid the eye area. Do not use the spray near naked flames. Allow pets at least 30 minutes for the Spray to dry before allowing near fires or other heat sources. When using the product, owners are advised to wear rubber gloves and to wash hands after use. Dosage and Administration: Spray the entire body of the animal from a distance of approximately 10 to 20 cm using the pump applicator. Apply the spray against the lay of the hair and ruffle the fur to ensure the product penetrates right down to skin level. Ensure the pet’s entire coat is thoroughly wet then allow to dry naturally. Do not towel dry. 3 to 6 mL/kg treats and prevents fleas for up to twelve weeks on dogs and up to eight weeks on cats. Higher rates may be required for long-haired animals or those with thick coats. For control of flea allergy dermatitis, a dose rate of 6 mL/kg should be applied monthly to the affected animal. For adequate flea control, all other dogs and cats in the household should be treated routinely using Frontline products. A dose rate of 3-6ml/kg will treat and prevent adult brown dog tick (Rhipicephalus sanguineus) infestation for up to four weeks. For prevention of infestation by paralysis tick (Ixodes holocyclus), a dose rate of 6 mL/kg will provide three weeks protection. Dense-coated animals may require higher dose rates. Ensure the entire coat is thoroughly wet, paying particular attention to the face, ears and neck. Animals should be searched daily for ticks during the paralysis tick season. For treatment of biting lice (Trichodectes canis, Felicola subrostratus), a dose rate of 6 mL/kg is required. All dogs and cats in the household should be treated at the same time, even those showing no signs of lice.